Lord John Grey was first introduced in the second Outlander book, A Dragonfly in Amber as a young man on his first battlefield. When he first meets Jamie and Claire, Jamie has just humiliated John in an effort to save John’s life and his own face. At the time I never paid the character any attention because I didn’t realize that Gabaldon loves to bring back minor characters when you least expect them, often times making them more important to the main story. After this first scene John Grey disappeared from the story, but then reappeared in Voyager after Jamie was imprisoned for his part in the Battle of Culloden. The two didn’t hit it off at first, because John resented Jamie for his humiliation and John was the prison warden. Eventually the two became friends over the course of time Jamie was imprisoned. A friendship that has lasted throughout the Outlander series. As I got to know John I still didn’t like him. Mainly because he was in love with Jamie and I’m not a fan of anything (or anyone) who tries to come between Jamie and Claire. However, as the book series progressed I’ve come to really like John. He’s an honorable man in love with someone who’ll never love him back. At least not in the same way. In Lord John and the Private Matter, Lord John has just returned from setting up Jamie in his new position in Helwater, and returned home to London. When he gets home, he discovers his cousin’s fiance may be suffering from syphilis, and investigates the matter but ends up caught in a web of espionage, murder, and London’s seedy world of brothels. This book was a nice change of pace from the voluminous Outlander books, and showed a side of Lord John not seen in the main series. Aside for his feelings for Jamie, the reader doesn’t get to know too much about John as he’s a very private man and holds to the conventions of the day where personal matters aren’t put on display for the world to see. What I found most interesting was how John as an 18th century homosexual from a prestigious family struggled to live his life under the threat of his true desires being discovered. 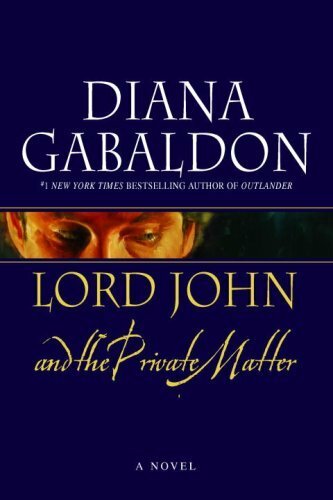 As John’s investigation took John to Lavender House, a place where gay men can come together and socialize, we get a glimpse at John’s past life after the death of his lover Hector, who died during the Battle of Culloden, and a bridge to the man John has become when we meet him again in Voyager. This book helps the reader understand John better, and sheds some light on some of his actions from the main series. I also found the mystery to be compelling, and enjoyed seeing John interact with other people than the Frasers. Plus, the new characters introduced were just as interesting as those in the Outlander series. Since I haven’t been reading the Lord John series as they take place in the Outlander timeline, but after the fact, I find this book makes me view John in a whole new light as I now am in possession of more of the facts pertaining to his life. If you are a fan of the Outlander series, I definitely suggest you check out the Lord John Grey series as well.